Contributed photo Front row (L to R): Karen Alexander, Sheila Bishop, Barbara Gonce. Middle row (L to R): Joanne Bryant, Barb Snider, Linda Cooper, Anne Dawson, Laurie Latta. Back row (L to R): Mary Ann Riggs, Cheryl Clark, Tori Binz-Hillstrom, Barbara Menasian, Heather Arps. Two years ago, in April 2017, quilt teacher Anne Dawson and quilt historian Karen Alexander of Lopez Island introduced a spectacular antique quilt which they and a group of 16 fellow quilters were in the process of reproducing. The 1876 Centennial Quilt Project was displayed at Woodmen Hall and described in The Islands’ Weekly (see http://www.islandssounder.com/life/1876-centennial-quilt-unveiled-on-lopez-island/). This unusual, original antique quilt, which Dawson patterned, is quite complex. It takes its name from the centennial date “1876” appearing in big bold appliquéd numbers. After receiving permission from Barbara Menasian, its Connecticut owner, Dawson began creating the 70-plus separate patterns in the summer of 2015 and taught the first of 38 class meetings beginning in September of that year. The group’s dream was to get all the groups’ quilts accepted for a special exhibit at the prestigious Houston International Quilt Festival, which attracts over 50,000 visitors each year from all over the world. Their dream came to fruition when they received word in January 2018 that their exhibit application had been accepted! All 18 members breathed a collective sigh of relief when the Houston Quilt Festival said that all 18 members’ quilts had been accepted. (Yes, there was a real possibility that only a few quilts would be selected.) The experience of tackling this project as a group had bonded these women in a special way and no one wanted anyone left out. In November 2018, 14 of the 18 pilot project members gathered in Houston, Texas, to see their quilts on exhibit. They all say it was the most memorable experience of their lives as quilt makers. In addition, Dawson and Alexander were videotaped for a webcast while in Houston and will be the focus of a radio interview in May for still another podcast. 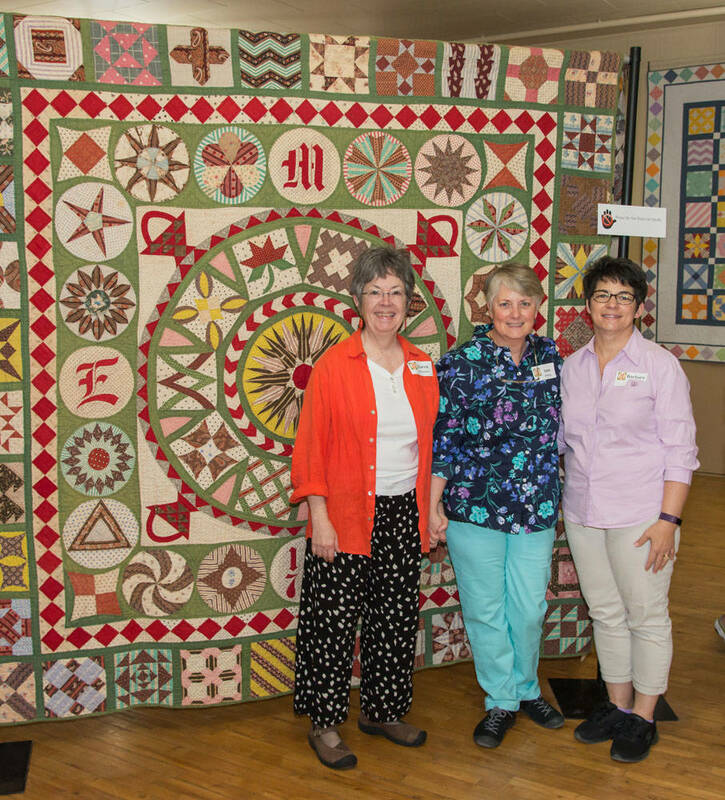 In fact, the exhibit was so well received that before the end of the Houston festival, the Lopez Island-based group was invited to show their quilts at the International Quilt Festival in Chicago in late March as well. Even more excitement was generated when Barbara Gonce of Lopez Island was told in December that one of her four renditions of the quilt (“Kaffe and Friends Meet Cirque de Soleil”) had been selected as the “cover girl” for the Chicago show brochure! And yes, a traveling exhibit is in the works, so stay tuned! Contributed photo Taken at woodman Hall, Lopez Island in April 2017. Karen Alexander (Lopez), Anne Dawson (Lopez), Barbara Menasian of Connecticut (owner of the original antique 1876 Centennial Quilt that Karen Alexander found on-line in a quilt history discussion group May 2015). Contributed photo Above: Exhibit in Houston.